On the Menu. Stick to simple - something you can prep the night before or make up in minutes that morning, or else it's going to be time for lunch before you get your breakfast in bed. My Sunday morning menu features only avocado toast, but to occasionally change things up a little I throw in some coriander, tomatoes, red onion, lime and chilli - I deem it guacamole toast. Other not-too-messy choices could be granola and yoghurt, overnight chia pudding, porridge or waffles and since it's all about having options, dishes of chia jams, fruits, breads, yoghurts and hot or cold beverages make for the perfect selection. Serving Suggestion. 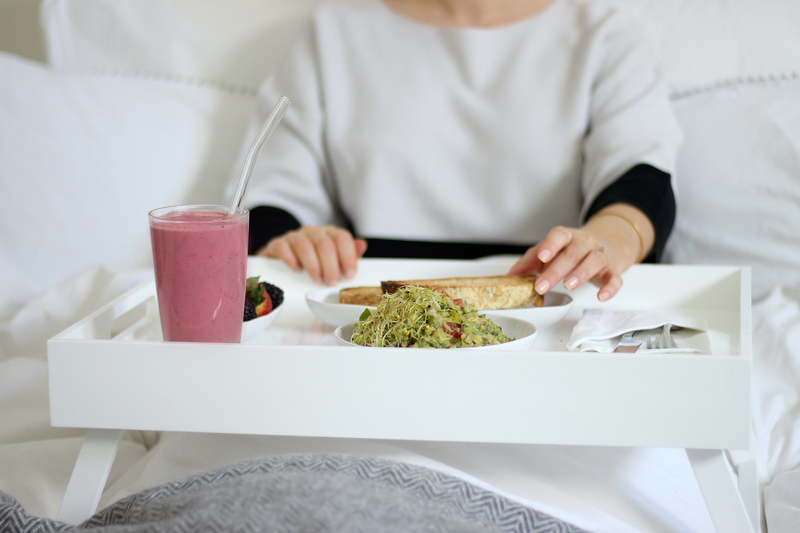 To save you from smoothie spillages, this sturdy but chic Breakfast in Bed Tray is the answer - with fold-away legs it's easy to store, a wipe-clean lacquered finish means no mess and it's roomy enough for plenty of food - plus, it doubles-up as a lap tray for tv dinners, what's not to love?! Plating Up. Think serve-ware with wide bases and high sides for catching crumbs, silverware and a napkin. Made from Portuguese clay, the Artisan Serving Bowls naturally have a non-slip base and are perfect for serving your main breakie dish whilst the Artisan Serving Platters are good for separate sides. 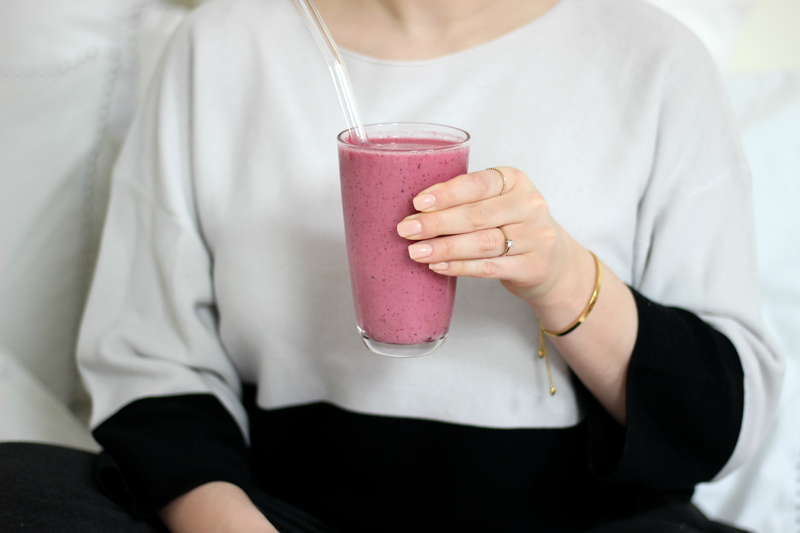 Drink-wise, if chilled and refreshing is what you're going for, smoothies and juices are best served in the chunky but elegant Elgin Highball Tumbler - (the amount of times I've knocked and dropped these and still not a breakage...). Cosying Down. 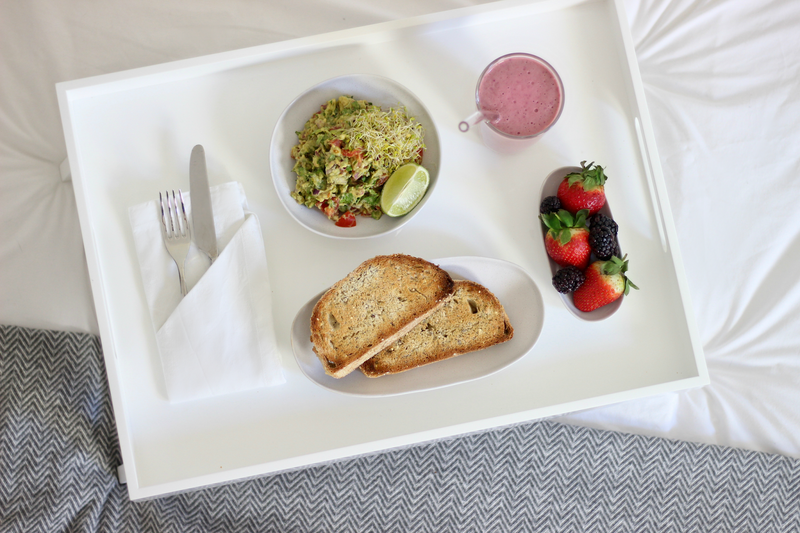 For the full breakkie-in-bed experience, it's all about the cushy bedding and comfy loungewear. To prop me up, the Super-soft Ultra Wash Large Square Pillow (a good choice for if a smoothie spillage is to happen) is like one big marshmallow when wedged behind your back and with the Avignon Cushion Covers, are both practical and pretty. The ultimate throw-on for me is the Cotton Colourblock Boxy Jumper - is it bad that I like to lounge about in this? It's SO soft and I basically spend all Sunday, every Sunday in it even if that's paired with my favourite jeans. In terms of actual sleepwear, the Tie Detail Pyjama Set is buttery soft against the skin and secures with a bow both top and bottoms. It's also long-sleeved if there's still a bit of a wintery chill but thin enough if the morning brings some spring sunshine - I double them up as loungewear since you can still pull them off as non-PJ's past 11am. If you fancy picking up any of the above to set up for your own breakfast in bed or simply a few new home or clothing pieces from TWC's new spring collection, The White Company have kindly given my readers an introductory 10% off orders plus free UK delivery over £50 (online & in-store) using the code JESSICATWC10 valid from 25th February 2018 to 18th March 2018. Happy shopping! T&C’s: Offer is valid on full-priced items only and cannot be used in conjunction with any other offer. Standard free UK delivery is valid for online, telephone and store mail orders to the UK mainland only when you spend £50 or more. Offer excludes gift wrap, gift vouchers, all furniture, beds, mattresses, upholstery and made-to-order items. Offer is not valid in our clearance stores. Valid while stocks last. For full Terms & Conditions please visit www.thewhitecompany.com/help/terms/. To redeem this offer in store you must present this code or show it on your mobile device. Offer ends midnight 18th March 2018.